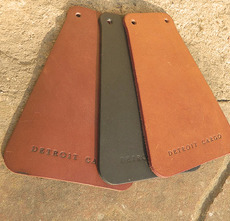 Detroit Cargo is a collection of high-end leather bicycle accessories with a sleek vintage appeal-- the kind that captures the retro urban style of fashionistas and cyclists alike. 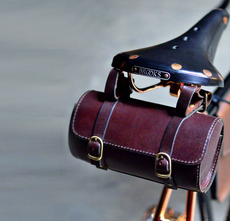 Coming in mouth-watering colors like Amber, Lager, and Stout, these fender mud flaps, hub shiners, and classic bicycle bags (for frame, handlebar and seat) bring minimalist, retro design to a whole new level. The company is co-founded by two friends with 20 years experience designing and importing mass market goods in the motorcycle and apparel industries. Life-long bicycle enthusiasts, they vowed to move away from the import-based businesses that dominated their markets, and the "crazy cycle of soulless consumption" they fostered. Instead, they set out to "trade mass market gadgets for local market soul." The two capitalize on their Detroit roots, taking advantage of the automotive and manufacturing industries that surround them. "Manufacturing here is so phenomenal. We needed an expensive piece of machinery to stamp out the leather. We could have bought it, but instead we found a handful of places that can do it for us. You drop it off in the morning and then come get it the next day." The result is a collection of high-quality accessories made locally and responsibly in low production runs, and designed to have as low a carbon impact as possible. 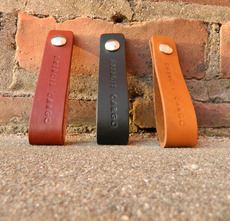 Products are made using only high-quality genuine leather and materials that are meant to last-- backed by an incredible 10 year workmanship warranty. 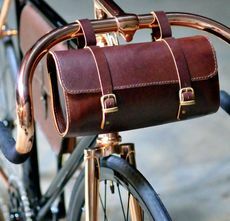 Why not vamp up your trusty bike with a bit of practical cargo that oozes classic vintage style and urban flair.